Are You A Shark Expert? Take Our Quiz And Find Out! 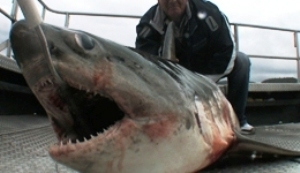 Beginning in April 2011, Outdoor Channel will begin airing the Madfin Shark Series, the only nationally televised catch and release shark competition in the world. Does your shark knowledge put you at the top of the food chain? Sharks are some of nature’s most fascinating and fearsome creatures. But how much do you really know about them? Take our quiz to find out! A shark's skeleton is made up entirely of what? How many years, approximately, do scientists say sharks have been on Earth for? True or false - the upper and lower jaws of a shark move? How many feet away can a shark hear sound? Approximately how many species of shark exist on Earth? Besides humans, what else has been known to attack/kill sharks? What kind of shark could you find in freshwater? True or false - if a shark's tooth falls out, it will never be replaced? On average, how many shark attacks take place each year?